There are two ways to add a bullnose effect to stair treads or steps: routing or molding. The routed edge is the only option for round steps. The molding option includes half-round molding or stair-nose molding on the front of the step. They attach to the front of the step with glue and nails. The routing option imparts the look of fine-woodworking. Half-round and stair-nose are only slightly less elegant and remain mainstays in the building industry. Install a 5/8-inch round-over bit in a router. Place the router base on the front edge of the step on the left side. Adjust the bit up or down so that the center of the cutting edge of the bit is centered on the edge of the step. Hold the router with both hands and turn it on. Ease the router and bit forward to cut into the edge no more than a quarter-inch deep. Pull the router along the edge to the other side of the step. Don't attempt to round the edge completely in one pass; go easy. The router won't be able to cut into corners; that's fine. Repeat Step 2 one or two more times as needed, gradually removing more of the edge, rounding it until the bearing rides along the front edge of the step smoothly. File the edges round where the router will not cut in corners. Use a medium-grit file to shape the edge as much as possible. Finish it off by sanding the edge to match the routed edge with 100-grit sandpaper attached to a hand block. Measure the length of the step. Cut the half-round -- it's shaped like a D -- or stair-nose molding to the measurement with a miter saw. 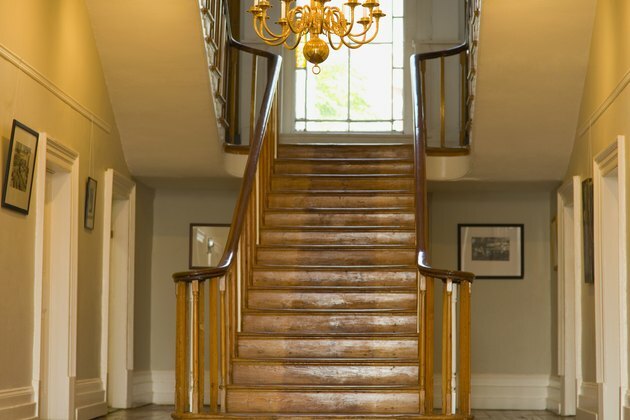 If the molding has an extended lip along one side of the D shape, it's stair-nose. Measure the distance from the front edge of the step to the riser. The riser is the vertical part that supports the step underneath. Add the thickness of the D shape to the measurement. Place the stair-nose molding upside down on a table saw with the "D" shape against the fence. Set the fence to the measurement. Rip off the outside edge of the molding to the measurement. Sand the edge lightly to remove rough edges or splinters. Sand the front edge of the step lightly with the hand block to remove any old finish, dirt or debris. Apply glue under splinters, and tape them down tight with masking tape. Remove the tape when the glue is dry. Sand off the dried glue. Apply glue to the molding. If the molding has the lip, apply glue to the lip. Apply glue to the front edge of the step. Place the molding on the front of the step. Stair-nose fits upside down on the step in this instance. The lip fits under the step. Typical stair-nose fits with the lip on top. Shoot one 2-inch finish nail an inch from each corner through the front. Shoot four more finish nails, evenly spaced and centered, through the front of the molding. Apply wood filler to nail holes, cracks and seams with a putty knife. Sand the seam between the molding and step smooth when the glue and filler is dry.